Great Lakes Forklift Batteries offers a full selection of refurbished forklift batteries, including 24, 36 and 48 volt. All in stock and ready to ship! All of our batteries come with an industry leading 1 year warranty. 90% Rated Capacity + Fully Rebuilt + Best Warranty in The Industry. In addition to our rebuilt forklift batteries, we offer a full selection of brand NEW industrial forklift batteries at the most competitive prices in the U.S.A., along with the best warranty anywhere. Our 24, 36 and 48 volt forklift batteries are available with an industry leading 5 year warranty. We ship nationwide, for FREE! Local installation available. Batteries are an unavoidable expense in an off grid system, Industrial sized batteries are hard to beat when it comes to cost per kilowatt hour. You can trust Great Lakes Forklift Batteries to deliver the best solution for your company’s off-grid battery needs. Email us for more information, or simply call us at 877-208-5632. 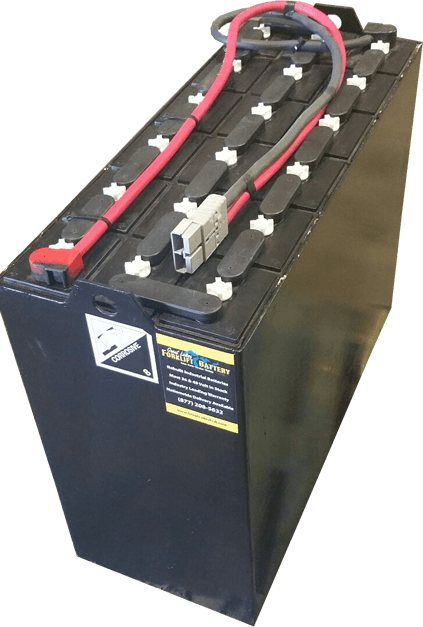 Order your new or refurbished forklift battery today! We will need to know your battery voltage. Determine your voltage by counting the water caps on your old battery and double that number. Example: 18 water caps equals a 36 volt battery. We also need the dimensions, front to back, top to bottom, and side to side. Call us with that info and we’ll get you the correct battery. Nationwide Shipping Available On All Forklift Batteries!